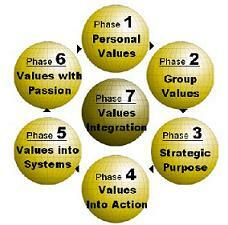 The Seven Phases of the Values Journey process are briefly outlined below. 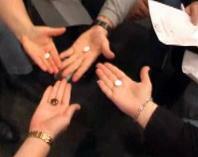 Each phase can conducted as a stand-alone session, although multiple phases are usually integrated into a program. The phases are generally sequential, ie Phase 1 is the pre-requisite to Phase 2, however phases 2, 3 and 4 are often experienced within the one program. The early phases of Values Journey are ideally conducted initially with the executive team, to gain “buy in” and the commitment to drive the process, in order to maximize impact. Team Programs are typically then “rolled out” to the management levels, then “cascaded” down through the rest of the organisation. 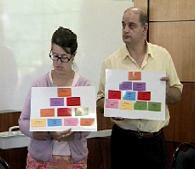 Phases 3 and 4 can be most effective with the involvement of a “vertical slice” of the organisation, including input from executive, management and team representatives. Phases 5 and 6 require intensive involvement of the CEO and Executive Team, as well as those responsible for Human Resources, Organisational Development, Learning & Development and the Training Department. Phase 7 involves administering a series of measurement tools, climate surveys, interviews and through the participation of all members of the organisation as well as the organisations external key stake-holders and partners.